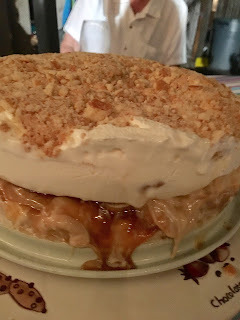 I had company over Saturday and made this delicious Caramel Banana Ice Cream Cake. Layers of homemade banana blondies, caramel, vanilla wafers, ice cream cake, whipped cream. This was fun to make and a delicious frozen treat for the Summer!